Lots of stags happen throughout the year, they mainly consist of lots of activities, drinks and fun and why not, this is your last days of being a free-man, however some grooms have other things on their mind. Bridegroom Rob Cocker recently found out that one of his oldest mates (David Deakin) had been diagnosed with Sarcoma, which is a rare form of Cancer, just to let you know that people with this horrible disease are given 1 – 3 years. So he turned his stag do into a fundraising event collecting more than £3,000 for Sarcoma UK and also raising awareness for this horrible disease. The stag group walked for 4 days averaging about 17 miles a day, even though there was a serious message to this stag do, they still managed to have a few beers and a right laugh. They finished their walk at The Riverside in Ilkley, there to greet them was David and 40 of his family and friends giving them a rapturous welcome. If you would like to donate please go to the Justgiving website. This is just another great Charity stag do story, we have many of them on this news feed collected over the years from mainly local press stories. It’s a shame that the national papers don’t pick up on this side of the stag do instead focusing on the badly behaved stag do stories. Unfortunately, according to the just giving website David Deakin has now passed. We have added a new city to our ever expanding stag do destinations and IT”S…. wait for it….. Sheffield – streamers, balloons, party poppers all went off courtesy of the Mayor of Sheffield, Denise Fox, OK she doesn’t know we’ve added Sheffield to our stag destinations however I am sure she’ll be pleased! The DesignaVenture team are frantically putting together packages, meeting up with hotels, lap dancing clubs, activity sites and nightclubs to bring you the very best stag dos Sheffield. That’s a great question, imagine a city with two universities, yes, two universities. Then imagine the amount of bars you need to cater for that may students? What about nightclubs, students love to party, at the last count I counted over 20 clubs (that also includes gentleman’s clubs), shish, 20 clubs, a weekend is just not enough. 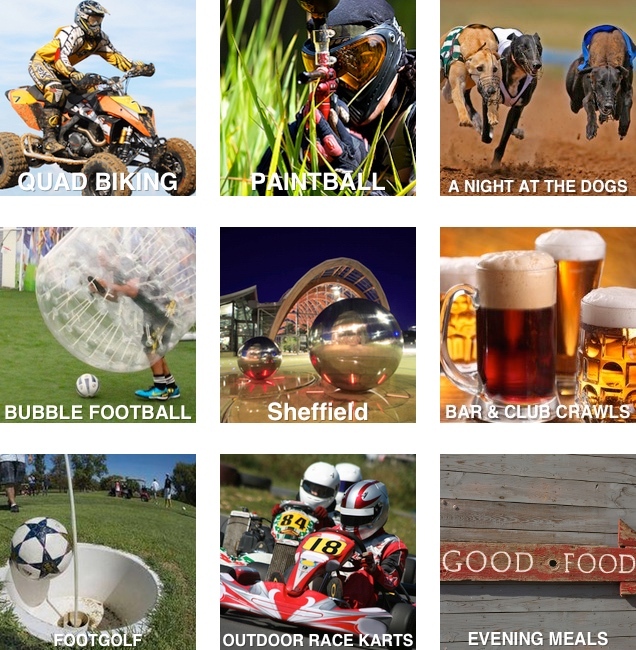 There are also some fantastic activity sites near Sheffield, from racing karts, shooting guns to racing quads, playing Bubble football, there’s enough to keep even the hardiest stag group entertained and out the pub. If you’re a big snooker fan, Sheffield is home to the world famous Crucible, cough, cough, it’s a bit smokey in there, well is used to be! People will call you love and if your a bit narked off then they’ll call you Mardy. If you would like more information on nights out in Sheffield, or what to do on a stag weekend, give us a call on 01432 830880.